George Edwin (Ed) Farrar had written to his family in Atlanta, Georgia on December 10, 1945. He stated in his letter that he would be leaving Chicago, Illinois on the 15th to come home for a family Christmas. I don’t know his method of travel. He may have traveled with another person by car, or perhaps by train. He expected to be home by the 16th of December. He sounded in high spirits and was looking forward to reuniting with older brother Carroll Jr. on the visit. 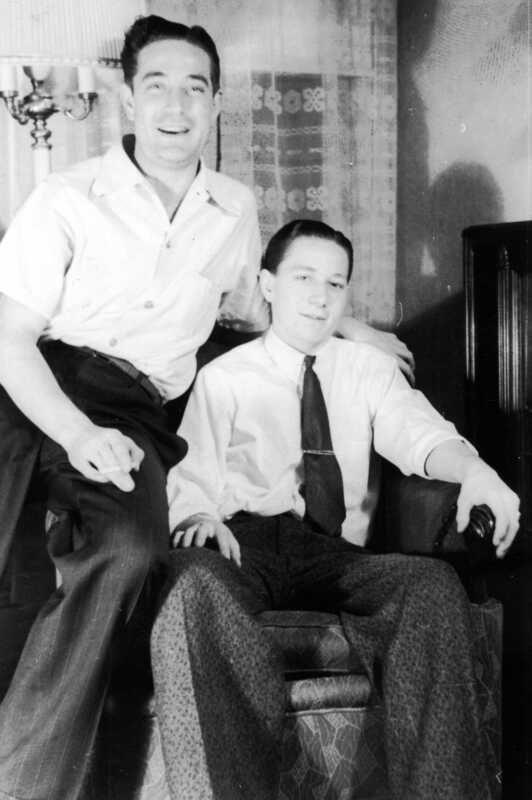 Left to Right: Carroll Johnson Farrar, Jr. and George Edwin (Ed) Farrar. Carroll Sr. and Raleigh Mae Farrar had nine children, four of them boys. Carroll Jr. was the oldest and had also served with the Army Air Forces during WWII, but in the Pacific theatre. My dad, George Edwin, was the middle child and second son. Younger brother Bob was the third Farrar son to serve in WWII, in the Navy aboard the USS Intrepid. The youngest boy, Gene, was too young to join the fighting. Raleigh Mae was excited about having most of the family home that year to celebrate Christmas and to celebrate that her three sons in WWII had all made it back home alive. Carroll Sr. was very ill and bedridden, but was anxious to see his boys back together again. Youngest daughter, Beverly, who was only eight years old at the time, remembers that Christmas to this day. Bob and Carroll Jr. had arrived home first. Carroll Jr. decided the house needed some sprucing up and took to painting and wallpapering the interior. There were no decorations, presents, or even a Christmas tree, so instead of a festive holiday atmosphere, the house was a wreck with Carroll Jr’s paint and wallpaper supplies scattered about. Six of the Farrar children gathered at their parents’ home for the holidays – Janet, Carroll Jr., Ed, Bob, Gene, and Beverly. Only three – Geraldine (Gerry), Martha, and Dorothy (Dot) – were absent. Ed was the last to arrive. Carroll Sr. had been waiting to see his boys all together, home from the war. He had been holding off the business of dying, waiting for his sons to arrive. A few days after their arrival, Carroll Sr.’s condition worsened and he was taken to the hospital. Beverly was sent to a neighbor’s house, the Patterson’s, while the rest of the family gathered at her father’s hospital bedside. Carroll Sr. died at Grady Hospital on December 20. Beverly remembers Carroll Jr. coming to the Patterson’s very late to take her home. He told her their father had died. She would spend her eighth Christmas, just five days away, without her father. Instead of planning a joyous holiday, the Farrar’s would be planning a funeral. Christmas Eve came with no Christmas tree and no presents. After Beverly was sent to bed, older brother Gene, fourteen years old, walked over to North Kirkwood in search of a Christmas tree. The tree lot was closed, but he found a tree he liked remaining and brought it home. When Beverly arose on Christmas morning, she was surprised to find a decorated Christmas tree and a Christmas present for her, a pair of skates, under it. Carroll Farrar, Sr. didn’t live to see that Christmas, but he did live to see what was much more important to him. He made death wait to take him until he saw with his own eyes all three of his sons who had survived WWII come together again for a family Christmas. Just five days before a very sad Christmas without their son, Bobby Stearns’ mother wrote to George Edwin Farrar’s mother. Their son was the bombardier aboard Lead Banana who was killed in the September 28, 1944 mid-air collision with Lazy Daisy. They hoped Farrar, the only survivor aboard Lead Banana, could furnish some details of the loss of their son that the Army Air Forces had apparently not provided them. Last evening we had a letter from the Quarter Master General stating that Bobby is buried in the U.S. Military Cemetery at Margraten, Holland in Plot “L” Row 12, Grave 299 – this is the same location as Lt. Henson’s grave – his is 297. While we hoped for a far different ending to this final chapter, it’s a relief to know he had a decent burial by his own people. We hope your son is recovered from his ordeal in the prison camp. I know he wants to forget it all as quickly as he can but there are just a few questions I’d like to ask and maybe some time when he feels like it he could write. 1 – Just how did the accident happen? We’ve heard several different versions but would like to know which is true. 2 – Were any of the boys killed by the collision or did they all get out? 3 – Did they go down over the city or country? 4 – Anything else that would help us have it straight in our minds. Like all the rest of the country we are having a severe winter which began in early November. We have been feeding the cattle since then so this will be a long winter for us. Had 16 in. of snow at the deepest and 17° below the coldest. Today’s paper says it has even reached as far south as Georgia. Our son Jim is discharged now and he and his wife June are home with us now. We are so glad to have them home. I hope your family is all together and that you are all well. That’s the best thing I can think of to wish you for the new year. Lazy Daisy collided with Lead Banana due to confusing and quick maneuvering to avoid colliding with another group head on. There was no flak and no ground fire that hit either fort. None of the boys on Lead Banana except my dad made it out of the aircraft before it crashed. They all died either from the collision itself or the ensuing fire and crash. I don’t know the exact location of where each fort went down, but I do know that the collision was said to happen near Magdeburg, Germany at 52°06′N 11°39′E. Both planes crashed approximately 20 miles northwest of this location. Lazy Daisy crashed near Erxleben and Lead Banana crashed approximately one and one-quarter miles north of Ostingersleben. Today, Google Earth shows this to be mostly farm land, or countryside, rather than a large city. (Note: Google maps do not show Erxleben in the correct location. If you want to locate Erxleben on the map, search on Ostingersleben and you will see Erxleben nearby, about 5km to the northeast). Robert Sumner Stearns has since been reburied at Golden Gate National Cemetery in San Bruno (San Mateo County), California, Section B, plot 302. He also has a memorial marker at the Juniper Haven Cemetery in Prineville (Crook County), Oregon. Again, I don’t know the date my dad, George Edwin Farrar, moved to Chicago, Illinois to live with the Buslee family. This letter from my dad to his mother does show he was living in Chicago in December of 1945 and records a planned trip home to Atlanta, Georgia for Christmas. Neumann – Buslee & Wolfe, Inc. Received your very welcomed letter this noon, and also the package. While I am thinking of it, if you receive another check from the Government, do not send it here. Just keep it there for me until I get there, as I am leaving here the 15th. And if it comes after you receive this, it would not reach me in time, and they would just have to send it back to Atlanta, and I don’t need the money at the present any-way. Was really wonderful news to hear Carroll was back in the states, and I know he is as glad as all of us put together, in fact that is the way it was for me. Hope he will be home by next Sunday, so we can all have Dinner together. I think that is the grandest bit of news I have had in some time. In your last letter you asked if I had heard from Mr. Henson. As yet I haven’t heard from him, but received a letter from Jeanne, but she didn’t say anything about her Mother or Father. He must be O.K. or she would have mentioned it, I am sure. About the turkey you spoke of. If twenty-two pounds is the largest Mr. Cobb can let you have, get it by all means, but if he should have another larger, get that one. I am going to pay for it. So just get the largest you can. I have had turkey about ten times, at dinners since Thanksgiving, and they are better each time. As you know Carroll and my-self will both be there at least a week after Christmas, and the bird will come in handy. The formal Saturday night turned out grand. I didn’t tell you all about it, or I can’t now, but here is a little. If you remember when I came from Chicago last I rode with Bill Olson, the buyer for Curtis Candy Co. Well Bill lives in Park Ridge, and is about 47 years old. Mr. Buslee and me made a call on him, about a week ago and invited him to the party, but as he was going to be out of town he was very sorry as his wife would just love to go. Well, we talked a bit, and after a call to his wife, the conclusion was that I take Mrs. Olson. Well I did and we had a grand time. I drove Mr. Buslee’s car, and Mr. and Mrs. Buslee went with me, while Jan and Gene went in their car. We had a gay time, and did not come home until having breakfast at four thirty in the morning. I sincerely hope Dad is feeling better by now. Hate so bad to hear he isn’t getting along well. He had better get better by Christmas, because he has just got to cut that turkey. He cut the last one when I was home for Christmas. Went over to Bill Farrar’s yesterday for dinner. He has a nice little place, and isn’t a bad cook at all. He had a couple other fellows up, and his table is just right for four. Don’t know if you will hear from me again, before I get to Atlanta, or not as I will be there a few days after you receive this. I would come there any-way now that Carroll is there. As it has been some time since I have seen him, and he never did answer my letters(S). I hope he reads this. Well I had better cut here so take it easy, and don’t work to hard so you will feel good for Christmas. I have been looking for a call from Hugh all day as he was to come here for the Soft Drink Convention, to which I am going. He may be in tomorrow, I hope nothing has happened. Please pardon my mistakes, as you know I don’t have a chance to type often. Carroll was George Edwin Farrar’s oldest brother who served in the Pacific theatre during WWII. Mr. Henson was the father of William A. Henson, the navigator aboard Lead Banana on September 28, 1944. Jeanne was William’s sister. The Hensons lived near the Farrars in Atlanta. Jan and Gene were Jan (Buslee) and Gene Kiefhofer. Jan was John Oliver Buslee’s sister and she was married to Gene. Bill Farrar was likely a Farrar relative, but there are many and I don’t know which one specifically. Not mentioned in the letter, but Ed’s younger brother, Bob, was also supposed to be home for Christmas that year. Bob was the third Farrar son who served in WWII, in the Navy. According to my Aunt Beverly, Carroll and Bob both made it home to Atlanta for Christmas before my dad arrived from Chicago. I can’t pinpoint a date when all of these events occurred, but I do know they must have occurred in the Fall of 1945. My father, George Edwin Farrar, received his Honorable Discharge and Separation from the Army Air Forces on October 29. 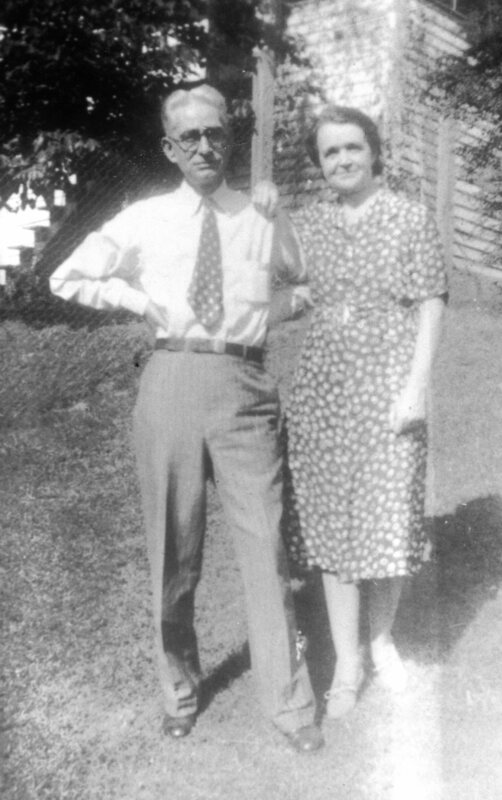 The date he physically returned home – to his parents’ home in Atlanta, Georgia – from WWII I do not know. I do know that Mr. and Mrs. Buslee traveled all the way from Chicago, Illinois to meet my dad and offer him a job with Mr. Buslee’s company, Neumann, Buslee, & Wolfe, Inc. My Aunt Beverly, eight years old at the time, remembers Mr. and Mrs. Buslee sitting in the living room of the Farrar home and visiting with my dad and his mother. Her father was very ill and bedridden and was not able to join the group. The Buslees primarily wanted to hear anything my dad knew about the events of September 28, 1944, specifically, the mid-air collision over Magdeburg, Germany between the Lazy Daisy and the Lead Banana, on which their son, John Oliver, was the pilot. My dad was the waist gunner on John Oliver’s crew and was the only survivor on the Lead Banana. I don’t know if what my dad was able to tell them put their minds at ease, but it was something they wanted to hear in person. As a result of their visit – and I don’t know if they considered this in advance or if it was just a spur of the moment decision – Mr. Buslee offered my dad a job. Neumann, Buslee & Wolfe were “Merchants, Importers, and Manufacturers” and they made and sold flavorings and essential oils. Mr. Buslee would teach my dad to be a salesman. My dad moved to Chicago into the Buslee’s home and as my Aunt Beverly put it, he “lived in their son’s room, wore their son’s clothes, and drove their son’s car.” He lived and ate with the family and was treated like he was their own son. What a difference a year can make in two different families’ lives. A year previous, both the Farrar and Buslee families were worried about their sons, missing in action after a mid-air collision over Germany. And now, the Farrar family had their son back and the Buslee family knew that theirs was never coming back. But the Farrar family was losing their son again. Yes, a positive move for him and only as far as Chicago, Illinois. But they were probably not ready to let him go even that far after what he had gone through the past year to make it back to them alive. The Buslees had a temporary replacement for their son lost in the war. Maybe my dad’s presence in their home softened the loss of their own son. Or maybe it made it all the more painful, a reminder on a daily basis that their son was gone. What a difference a war can make.